You are here: Home ∼ 2010 ∼ November ∼ 25 ∼ Happy Thanksgiving! Happy Happy Thanksgiving! I hope that you all have a wonderful day filled with love, friends and family. 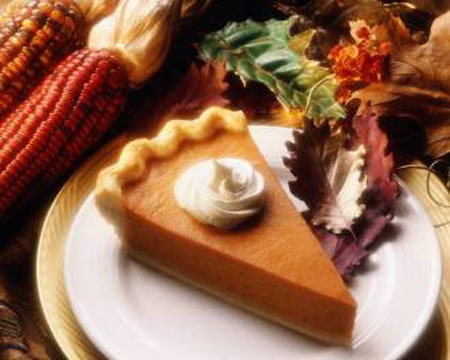 And I hope that you end the evening right with a delicious slice of pumpkin pie! Homemade, from scratch or store bought. It doesn’t matter! Just enjoy it! Add a little whip cream or vanilla ice cream and pour yourself a hot cup of coffee, sit back and relax. And have a Happy and Blessed Thanksgiving. OMG OBSESSED! *A special thank you to all of you who take the time to visit OMG OBSESSED and read my posts. I am truly grateful for each and every one of you. I am truly grateful for you. Your post brighten my days and make me smile. Thank you.